It's always a good idea to be familiar with the money of the country you'll be visiting. 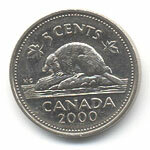 Canadian coins are easy to use for two reasons: their varying sizes and very Canadian symbols. 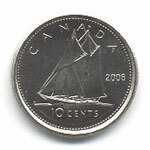 The 50¢ or 50 cent piece is rather rare and usually features our country's Coat of Arms. 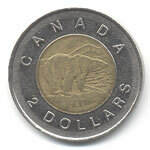 Seen above are the standard coins which we see and use every day. The 'tails-side' has a Canadian symbol on it, such as the maple leaves on the penny, or the caribou on the quarter. The 'heads-side' has an effigy of Elizabeth II - showing her at different stages of her reign - and yes, we do all age! 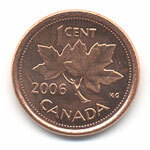 The Canadian Mint likes to celebrate many different milestones by creating new coins. Many people have asked me why we have so many different quarters for example. Well, in 1999, for every month that passed, there was a new quarter with a different symbol - each with its own special significance. And again in the year 2000! 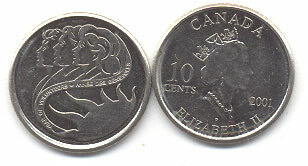 Seen here is a quarter designed to mark Queen Elizabeth II's 50 years on the throne in 2002. What can we say... we Canadians love to celebrate! Just give us a reason. So don't be confused. 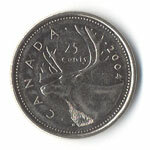 A quarter may not always have a caribou on it!! These commemorative coins are quite interesting to find. The latest hype came over the red-colouring on a coin commemorating the sacrifice of our war veterans. For some reason this story just wouldn't quit, and stories of 'spy coins' even began to emerge. 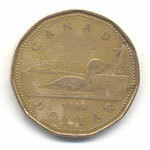 So the next time you get a handful of change - don't curse - check for neat and even unique Canadian money!